A new term has been coined to refer to people fleeing their countries and areas they traditionally inhabited as a result of changes in weather. According to the International Organization for Migration global warming had driven an estimated 24 million people from their homes by 2010 - a number, they warned, could rise to as high a billion people by 2050. It is argued that natural disaster induced displacements were fast overtaking displacements from conflicts. Western part of Kenya and many rural areas which heavily rely on agriculture are now staring at starvation as lands lay bare with nothing to harvest. The rains have failed. People are moving elsewhere, including in the already overcrowded cities. 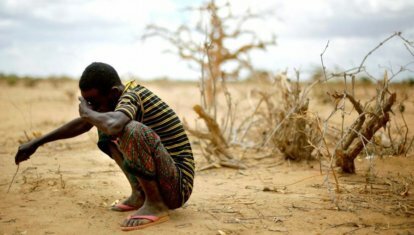 Kenya aware of the ticking time bomb that is the growing number of climate refugees has been pushing for the recognition of populations made refugees by natural disasters. The story seeks to understand and interview Kenyans who have abandoned their farming as climate change affects their daily activities. They have moved trying to look for other ways of making ends meet. They have now become known as climate/environment refugees. Thanks for your support! This story is completely funded. You find Bob's story in our dossier ESCAPE.